Summary on Goodreads: “In a public square in Beijing in 1904, multiple murderer Wang Weiqin was executed before a crowd of onlookers. He was among the last to suffer the extreme punishment known as lingchi. Called by Western observers “death by a thousand cuts” or “death by slicing,” this penalty was reserved for the very worst crimes in imperial China. 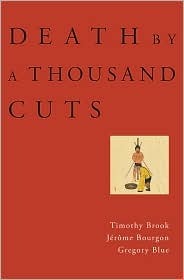 A unique interdisciplinary history, “Death by a Thousand Cuts” is the first book to explore the history, iconography, and legal contexts of Chinese tortures and executions from the tenth century until lingchi’s abolition in 1905. The authors then turn their attention to an in-depth investigation of “oriental” tortures in the Western imagination. While early modern Europeans often depicted Chinese institutions as rational, nineteenth- and twentieth-century readers consumed pictures of lingchi executions as titillating curiosities and evidence of moral inferiority. By examining these works in light of European conventions associated with despotic government, Christian martyrdom, and ecstatic suffering, the authors unpack the stereotype of innate Chinese cruelty and explore the mixture of fascination and revulsion that has long characterized the West’s encounter with “other” civilizations. In Autumn 1904 Wang Weiqin was executed in Beijing. The manner of execution is called in Chinese lingchi chusi, “to put to death by lingchi”. It has been translated as “death by a thousand cuts”, “death by slicing”, and “the lingering death”, none of which are an accurate description of the process described in the first chapter of this book. Even though parts of his flesh were sliced off before he was dead, he was most likely heavily sedated with opium. Lingchi was considered the most severe form of penalty, next was decapitation which was considered worse then strangulation. The order of severity of these methods of execution suggests that is was the separating of the body that was the worst thing that could happen, that perhaps one became less human if their head was separated from their body and humanity was totally destroyed if the body was cut in pieces as happened with lingchi. Even burying in an unmarked grave appears to be a part of the penalty and has some significance. Decided to give up on this book. Not badly written but it reads like a textbook. With this subject matter, that is probably the best way to write but it makes it very difficult for me to read. I may get it again when I don’t have as many books to read. Realistically I probably won’t ever pick it up again. Posted by Belleza on August 7, 2012 in 2012, History, Non-Fiction and tagged 2 Stars, China, Gregory Blue, Library Book, Timothy Brook. This sounds like a thought provoking book but a hard one to read. If it reads like a textbook to you I would have had a rough time getting through it also. It’s hard with non-fiction books as this can happen even with the most meaningful and important topics.